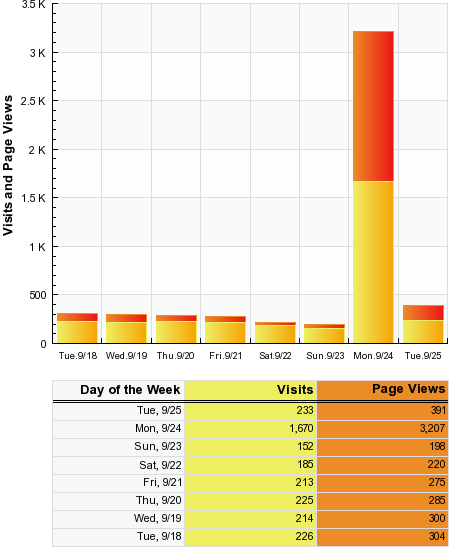 My little blog doesn’t get too much traffic–on average, around 150-200 unique visitors a day. I have some 140 subscribers to my RSS feed, but almost 80% of my traffic comes through search engines. I haven’t implemented item view tracking in my RSS feed yet, so I have no idea what percentage of my subscribers actually read my feed. Only 5 out of the 7 comments I actually did get were from people I didn’t already know, which I’m guessing arrived via SU. This is a remarkably low percentage of overall visitors. Someone else eventually submitted a link to my entry to Digg, which brought a lot less traffic than I would have expected. Although my few CPM ads might have gotten a small bump, my CPC ads CTR was zero. The extra traffic did not convert into extra revenue, at all. According to FeedBurner, I may have picked up 9 new subscribers. That’s only 0.5% of the new visitors. Now, I’m not surprised by this–it actually confirms suspicions I’ve held for a while now. But, as I’m thinking of reworking my blog layout and design, it’s always good to get real data as a baseline before I start making changes.